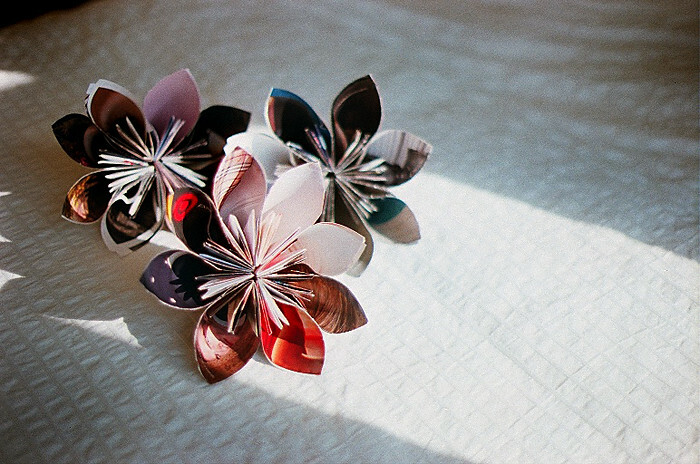 Kate Bullen: Make: Magazine flowers. Magazine flowers! Super fun and easy to make. Google magazine flowers and instructions should pop right up. I'm trying to find more time patience to do crafty things lately. The heat in Boston has been terrible. I haven't been up to much except writing/dropping off resumes (yes, still), and going to the local pool. Oh, and I've joined the gym again. I am laughably out of shape, but I'll come around. My whole family is in Ontario this weekend, where my mom is hosting the family reunion. I'm sad I can't be there to enjoy the lake and the party.